Lightning Powder 4-3005 3M Trace Evidence Collection Vacuum FREE SHIPPING! Collect the tiniest of particles down to 0.1 micron (approximately 1/4 the diameter of a human hair follicle) with the Lightning Powder 3M Trace Evidence Collection Vacuum. 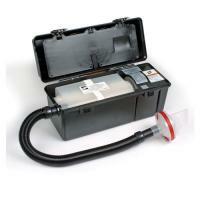 This complete vacuum system comes with individually wrapped, single-use 10 cm (4 in.) filter nozzles that are packaged in a clean room to guarantee anything you collect will not be pre- or cross-contaminated. You can then ship the nozzle to the crime lab with confidence using a provided evidence bag. This vacuum also has the benefit of being completely contained for easy transport to any scene. The 15-foot (4.5 m) power cord and 8-foot (2.4 m) hose are housed inside the case, making this a convenient and compact unit that's ready to go (and easy to store). Note that the internal filter should be periodically changed to avoid decreased airflow. Please consult the manual for changing instructions. Vacuum particles as small as 0.1 micron. 4.5 m (15 ft) power cord. 10 cm (4 in.) filter nozzles. ©2002-2019 CopsPlus.com: Lightning Powder 4-3005 3M Trace Evidence Collection Vacuum FREE SHIPPING!